In 1939, songwriter Leon Rene was listening to the radio one morning when he heard the announcer say the swallows were about to arrive at the Mission San Juan Capistrano. He got the idea for a song and wrote "When the Swallows Come Back to Capistrano." Leon Rene was born in Covington, Kentucky, in 1902 (some sources list Covington, Louisiana). He moved to Los Angeles with his older brother, Otis, in 1922 and founded the record companies Exclusive Records and Excelsior Records. They produced such artists as Nat "King" Cole, Johnny Otis, and Joe Liggins and His Honeydrippers. The brothers were the first owners of an independent record company on the west coast of the USA, and also owned publishing companies. Leon Rene died in 1982. 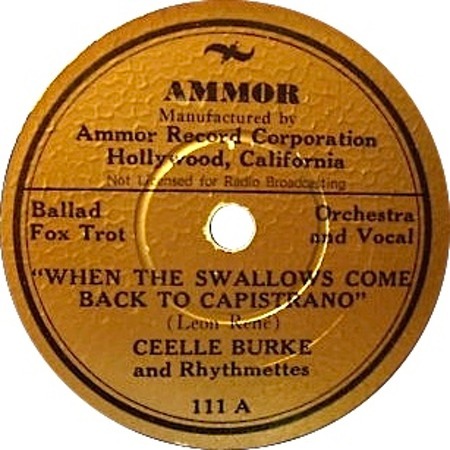 Ceelle Burke's original recording of "When The Swallows Come Back To Capistrano" was made in April 1940 and released on a number of labels, including Ammor 111 and Exclusive 102. A host of other artists recorded the number in the coming months, including The Ink Spots, Gene Krupa, Glenn Miller, and Gene Autry. Elvis's version is an informal home recording, never intended for release.